Hi friend! I hope you’ve been having a beautiful week. Today I want to share with you one of my absolute favourite energy balls recipe that I created way back in October of 2012 (I’m currently updating this post in June of 2017!) and which is still one of the most popular recipes in my cooking classes today! It’s super simple and packed with nutrition and chocolate, so what’s not to love? Since life is often hectic you may not always have time to prepare healthy meals when you’re on the go. I get that. I’m currently enrolled in two full time programs and sometimes I just don’t have time between classes to cook up a meal. 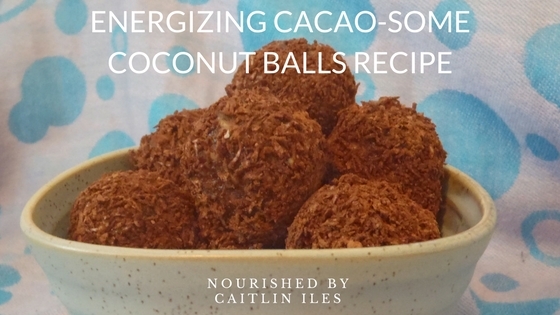 This may also be why the unofficial theme of this week became “quick and easy things for Cait to eat as she runs around the city.” Enter these Cacao-some Coconut Balls! These little balls of goodness are a delicious and simple alternative to store-bought granola bars and contain tons of healthy ingredients to help keep your blood sugar balanced. This balance is necessary to maintain energy levels throughout the day and to avoid that 3 o’clock slump where all you want to do is crawl into bed and take a nap. When this tidal wave of exhaustion hits, it’s an easy thing to reach for a donut, bagel, or sugary granola bar to give you that hit of energy you need to get through the last couple hours of your day. However, due to sugar’s easy absorbability into the blood stream, this energy won’t last and can wreak havoc on your productivity, mood, and health when relied upon in the long term as a quick fix. In order to slow the absorption of sugar into the body it’s so important to make sure every meal and snack that you eat contains healthy (and oh so delicious) fats, protein, fibre, in addition to carbohydrates. These chocolate balls hit all the requirements and as a bonus, they taste like candy so you can eat healthy food that doesn’t taste like cardboard! Do you think Frodo would have had the energy to walk to Mordor if he’d been relying on sugary treats for his energy needs? Of course not! He relied on Elvish Lembas bread, a recipe for which can be found here. As you can see this bread also contains protein, carbs, and healthy fats. Yay! However, for us gluten-free individuals these balls are a great alternative. The ingredients, such as dates and nut butters, have been selected for nutrient value and maximum deliciousity. Plus they’re totally customizable. Just use this recipe as a starting point and let your creativity fly. Lets dig in! Pit dates and soak in a ½ cup of hot water. Set aside. Add pumpkin seeds, cashews, goji berries, coconut, and cacao to a food processor. Blend until broken down, but still chunky. Next add the dates and water to the food processor. Blend until smooth. 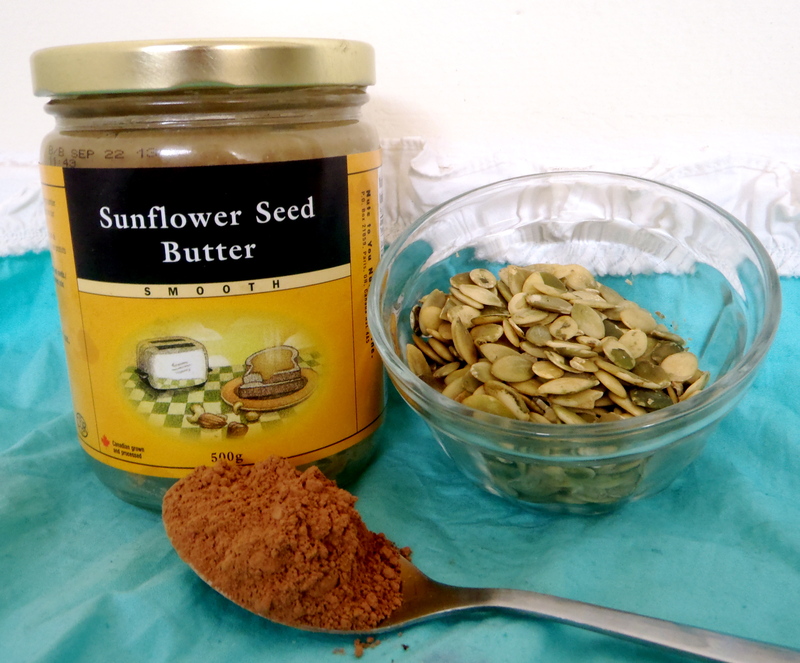 Add dates, sunflower seed butter, and sweetener to dry ingredients. Mix with a spoon or spatula until combined. Chill for 10 minutes or more in the freezer. Remove from freezer and roll into bite sized balls. Mix leftover cacao and coconut together and roll the balls in the coating. Best served chilled. Can be stored in the freezer for a long time. High in natural fibre, so they have a low impact on blood sugar. They also contain the same antioxidants found in green tea, so they pack a one-two punch for immunity! This alternative sweetener comes from the dried pulp of the lucuma fruit native to South America. It has a sweet, almost caramelly taste but it’s loaded with fibre so it contains very little actual sugar. Full of antioxidants, such as beta carotene, and iron to help increase energy, this fruit is a great alternative to sugar (boo! hiss!) in recipes. These shrivelled little berries contain a remarkable concentration of antioxidants that help combat premature aging, with 10 times more antioxidants than red grapes. They also contain high levels of vitamin C to boost immunity, which is great for cold and flu season. You can substitute pretty much any nut butter or any seed until your find a ball that’s right for you! This is a great source of Vitamin E, which is an antioxidant and promotes brain health. It also provides healthy omega fats, which decrease inflammation. Finally, they contain protein and fibre to help balance blood sugar. Whew! What a seed! These seeds are a great source of zinc, which helps heal the digestive tract to promote better overall digestion and immunity. Again, they’re loaded with fibre, healthy fats, and protein. In nib or powdered form, cacao is super high in antioxidants, magnesium, and soluble fibre. Plus it makes everything taste like chocolate cake. Need I say more? These guys are my favourites and they’re the highest nut source of monounsaturated fats, like those found in olive oil. And I’m sure you know how healthy olive oil is, right? They’re also rich in omega-3 fats, fibre, protein, magnesium (great for relaxation and muscle function! ), and copper. This nut is one of my all round kitchen staples. From the milk, to the oil, to the yummy shredded meat, coconut contains medium chain triglycerides, which are a type of fat preferentially burned by the body, so they won’t be stored on your booty. Everybody wins! Thanks for joining me today friend! If you’re looking for other delicious, simple, and energizing recipes then make sure you check out my Vanilla Matcha Cashew Bomb Recipe, No-Bake Chocolate Walnut Brownies, Tahini Walnut Magic Bars, and my Grain-Free Ginger Granola Bars! Making me so hungry! I’ll have to try making these sometime soon! Love this rezzz Cait…will have to give it a whirl out here in Lalaland!